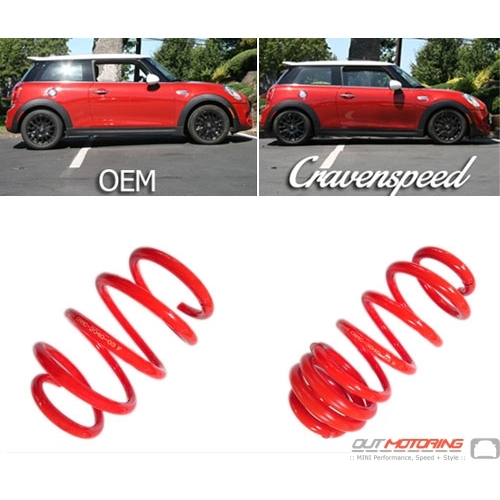 The Perfect Drop Cravenspeed performance springs are designed for a 1.25" drop in the front and rear. Keeping your OEM stance, and lowering your center of gravity. Built for Speed and Comfort Cravenspeed Performance Springs are wound with induction heated steel of high tensile strength and chrome silicon vanadium alloy. This provides reduced spring weights with a high material strength, effectively reducing the unsprung weight of the vehicle for improved handling and a better performance. Cravenspeed springs have also been shot-peened for a long life.